This gorgeous Edwardian engagement ring showcases a dazzling old European cut diamond in a compass-point setting, with four diamond accents twinkling alongside each prong. 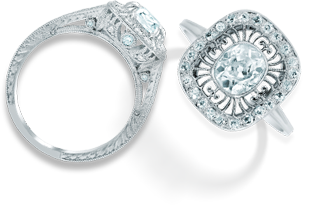 Piercing, engraving, and milgrain detail embellish the gallery and the sides of the ring (approx. 0.64 total carat weight).